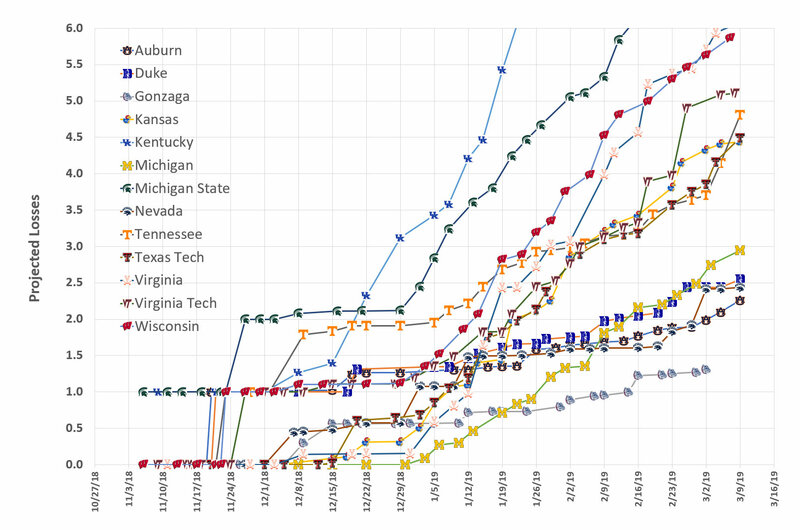 This is my DPPI projected losses for all top 10 teams. This includes all AP top 10 and DPPI top 10. I have Kentucky rated 58th in the DPPI and projected to lose about 15 games. Somehow they are in the AP top 10. KU is currently projected to lose 4.5 games which would be 6th among these teams. Gonzaga is first with a projected loss total of 1.3. Auburn is 2nd at 2.3 followed by Nevada at 2.4, Duke at 2.5 and Michigan at 2.9. If the DPPI was used, Kansas would be the top 2 seed in the tourney. Let's hope non of this comes true and KU loses zero . So if true corpus we will make up massive ground on kentucky in all time wins this year. I think we are 16 games behind now and these projections wld take us to 5 behind i think which doesnt include any post season advantage we might get. It wld be terrific for hcbs to get not only phogs record by 2023 but to overtake kentucky as well in his tenure. Then we wld truly need to make way for another statue outsude the fieldhouse. I had not thought about gaining on Kentucky but that sure would be sweet. Since Coach Self took over at Kansas, he has gained 23 games (actually passing) North Carolina and has gained 33 games on Kentucky to pull within 15. We are currently 16 games ahead of North Carolina. I suspect Kentucky will end up being a little better than they have played thus far but it sure seems likely if things go according to script, we could gain 5 games on them this year, at least. It would be sweet indeed if we win the National Championship game and that win pulls us 1 game ahead of Kentucky. Hey, it is not out of the realm of reasonable possibility.